I have just had a look through all your images and I have to say I am amazed. Let me apologize in advance for the length of this message. In the 6th grade I had to do a report on a country, any country in the world, and I randomly chose Nepal. Since that day I have been entranced with the region and have not been able to get the Himalayas out of my mind. I hope to someday visit the area although I doubt I\'ll be able to make it much farther than base camp on Everest, I have poor knees. Until that day I will enjoy your images and keep saving. Thanks for the inspiration. I have to completely agree with you also, we as a race are treading on thin ice I only hope we can correct our mistakes before it is too late. Those people walking sure put the Taj into perspective. Came here from a link too, will definitely be back. A British traveler I met in Chile told me a few interesting stories about India. He had first visited the country in the 70s or early 80s, and then about ten years later. On his first trip, he found the people wearing traditional clothes. When they bought food, it would be wrapped in some sort of large leaf. The consumer would simply throw the leaf away, and it would decompose quickly since it was biodegradable. On his next trip to India, he noticed some differences. Because of the Western influence, he noticed many people wearing jeans, forgoing their traditional apparel. He thought this was strange, as jeans are quite fine in the dry, cool region of California, but quite uncomfortable in the hot climate of India, compared to the traditional clothing. He also noticed that instead of leaves, the Indians now had plastic bags. But the habit was the same. Toss the bag. So there was litter everywhere. Compare this to other countries, like Austria for example, that have trash bins almost everywhere you turn, and the citizens are very diligent about using them. I even saw local spit in a trash can, rather than spit on the sidewalk, while walking down the street. Ok, so they are a bit extreme there, but there is some truth to the German cleanliness, and I if I recall correctly you are from a nearby country (Holland), so it’s a different culture. Basically, in a colder climate, even biodegradable stuff takes a considerable amount of time to decompose. So coming from a place like that, perhaps you are careful about picking up stuff. So, just a theory. Even so, you would think, at the site of one of the wonders of the world, it would occur to someone to clean up the trash, but I suppose that India, a sort of free-for-all democracy, like Chile, has better places to spend their money, such as lining the pockets of the plutocrats that run the country. And with the U.S. seemingly following in the footsteps (let us privatize the rest stops, etc) perhaps we can see a sort of India-like America in our future, perhaps we already do. You would think that those in India, and those in the U.S., would be embarrassed about something like this. But no. It must, like everything, start at the grass roots. Someday, India, will see it’s former glory. 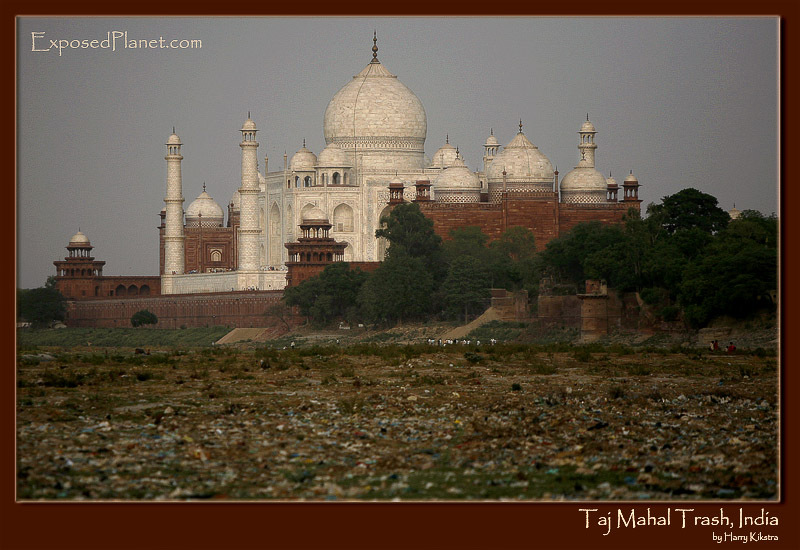 The story behind "Taj or Trash Mahal, India"
I have many more images of this wonderful piece of art and the greatest monument of love in the world and will post some later to show its beauty and the story behind it. But now I will focus on an uglier aspect of India. He seemed a bit surprised but agreed full-heartedly. Almost one 5th of the world’s population lives on a relatively small piece of earth, which geographical features range from sandy paradise beaches, through deserts, forests and the wonders of the Himalaya. One of the most well-known symbols of India worldwide is the Taj Mahal. Most people visit the Taj from the entrance in the old city of Agra to see its pristine beauty. But if you take a different view -literally- you can go see this from the backside. Basically the same as the building is symmetrical, but many square kilometers of trash are polluting the fields surrounding this pride of India.